This past week I’ve been at a super-fun conference with some really great people. During the conference the women were often found chatting about families, groceries and budgets. I could not resist bragging on my favorite grocery store chain. 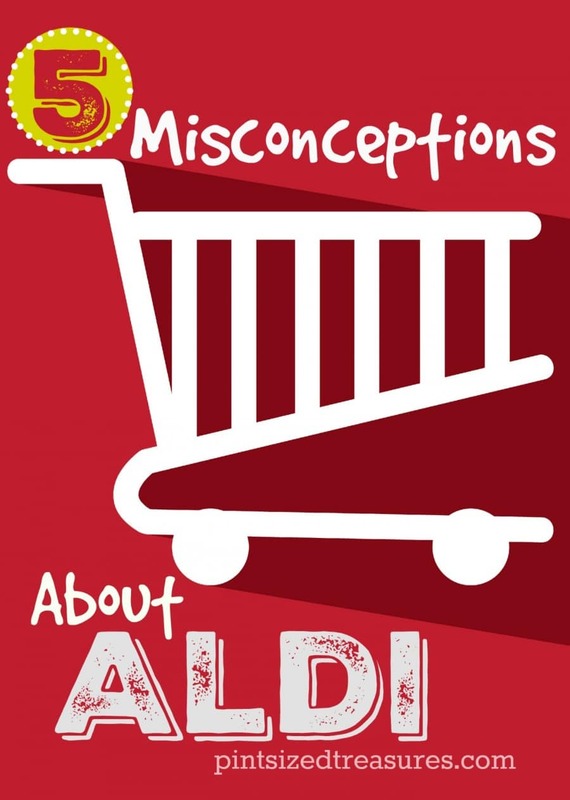 In fact, Aldi did not compensate me for talking about their business, I just LOVE their store and want to erase common misconceptions that keep people from entering one of the best grocery store chains on planet earth! Frugal penny pinchers have been entering the doors of my favorite, German-owned, discount grocery store known as Aldi for well over a decade. Often times they return from the grocery store gabbing about the awesome finds and deeply discounted prices to their neighbors, friends and anyone that will listen. 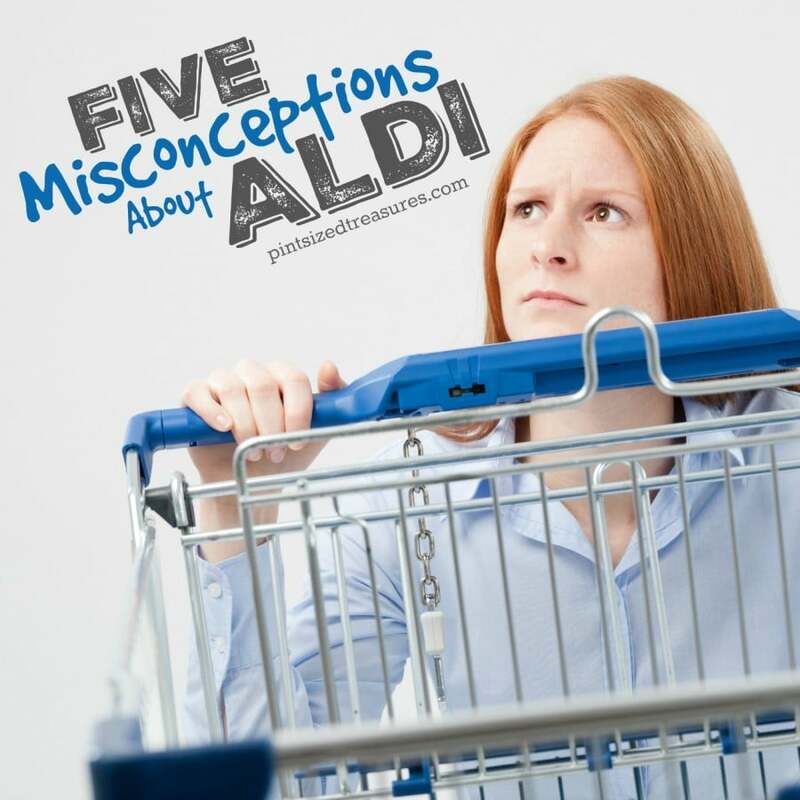 However, many people have misconceptions about Aldi. Those misconceptions often come from people who have never visited the store, but only half-way listened to their frugal, budget-savvy friends. Before you snub your nose at shopping a well-known discount store, consider these misconceptions and reconsider if you’re truly missing out on a supermarket gem. There are jewels to be found and money to be saved at this well-known, highly praised grocery store that keeps growing and growing. And remember frugal friends, SAVING money is equivalent to MAKING money. You have to pay for your shopping cart. Really? This one makes me giggle every single time I hear it. The truth about the shopping cart is that you have to insert one quarter to unlock a cart. Then, after you shop, you RETURN your cart and click — your quarter is returned. Aldi uses this method to cut down on workers having to chase down shopping carts in the parking lot. Genius idea, if you ask me! The shopping bags are expensive. If you visit Aldi, notice the other customers. You will see very few people purchase shopping bags. Instead, the majority of customers bring their own reusable shopping bags or use empty boxes from the store. You want to save the environment, right? Aldi already had that idea over a decade ago! They don’t carry specialty diet foods. My daughter is on a very strict gluten-free diet and I couldn’t be happier with the gluten-free selection at Aldi. Not only do the food products taste amazing, but they are 30-50% cheaper than other competitor supermarket chains. If you’re on a sugar-free diet, there are lots of options as well. Almond milk? They keep it stocked. Coconut oil? That too! They don’t sell organic options. A few years ago our family was on a tight grocery budget. You would see us completely overlook the organic section in our local supermarket because we knew the prices would not fit our strict budget. But now? You will find almost all organic food in our pantry and fridge. Why? Because Aldi sells loads of organic products — from produce to snacks. Now that will make a budget conscious person smile! The food is second rate in taste. I would have to beg to differ. In the past few months I have had several Greek yogurt companies send me their food products to review, and Aldi held its place in the Greek yogurt race. Just take a quick tip from this Greek yogurt addict — wait until you get to the very last cold food section before piling yogurt in your grocery cart. That’s where you’ll find smooth and creamy salted caramel and apple streusel flavors! If your family loves snacks, Aldi is the KING in super-frugal snack options. Don’t be afraid to try the brands at Aldi. They’re really fantastic in taste and flavor! Next time your frugal neighbor, friend or family member is heading to Aldi to grab their yummy finds, tag-a-long! You’ll be sure to become an annoying, budget savvy friend who’s always there to remind others, “You could have gotten that cheaper!” Oh, and I hope you’ll share this article to get the word out about these misconceptions! Too many people are missing out on an awesome, budget-friendly shopping experience!